Lightly grease bottom and sides of a 9 or 9 1/2-inch tart pan (with a removable bottom). In the bowl of a food processor, combine wafer cookies and sugar. Process to a fine crumb. In a medium microwave-safe bowl, combine butter and chocolate chips. Microwave on HIGH for 1 minute; stir. Microwave on HIGH in 15 second intervals, stirring, until melted and smooth. Pour butter mixture into food processor. Pulse with the crumbs until well combined. Press crumb mixture into bottom and sides of prepared tart pan, using the bottom of a drinking glass to firmly press the mixture into the pan. Place pan on a baking sheet, then freeze 1 hour until firm. When crust is firm, top with a single layer of halved cherries, cut-side down (you might not use all the cherries). Return to freezer while you prepare the filling. In a large microwave-safe bowl, combine chocolate chips and 1/4 cup heavy cream. Microwave on MEDIUM in 20-second intervals, stirring, just until melted and smooth. Stir in maraschino cherry juice. In the bowl of a stand mixer, beat remaining heavy cream and sugar on high speed until soft peaks form. Stir in 1/3 of the whipped cream mixture into the melted chocolate mixture. Fold in the remaining whipped cream mixture until just incorporated. Carefully spread mousse over cherries in tart pan; smooth top with an offset spatula. Return to freezer to chill 1 hour until firm. Top with whipped cream, chocolate shavings and maraschino cherries just before serving. 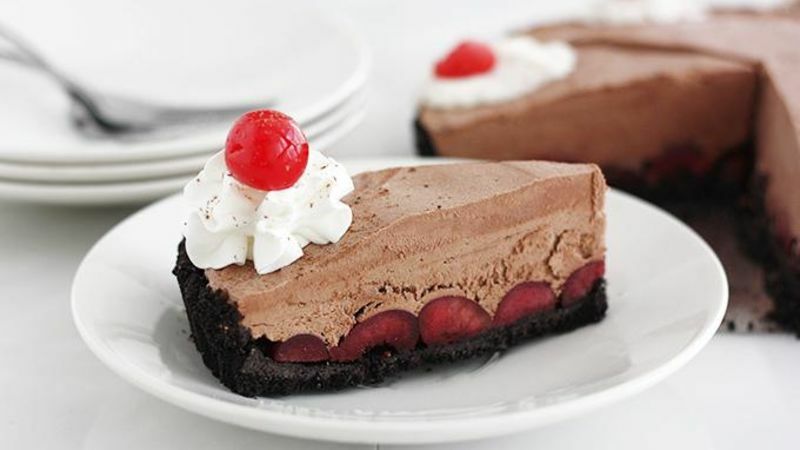 Sweet cherries and chocolate mousse in a decadent chocolate crust. Oh, and did we mention it's easy? Soooo… Valentine’s Day is this week. Are you ready? Do you have your Valentines written, your chocolates purchased, your date night all planned out? Or are you more like me and you’re thinking pajamas, take-out and a movie at home will do just fine? In either case, I suggest – nay, implore – that you squeeze in this Black Forest Cherry Frozen Tart (inspired by Love and Olive Oil) for you and your main squeeze. It’s so good, you won’t even think about the fact that it’s frozen just like the tundra that’s probably right outside your door. HAKUNA MATATA. First, make the black-bottom crust. It’s made with chocolate wafers, sugar and butter… oh, and more chocolate. So you know it’s good. Press it evenly into a greased tart pan, then freeze it for an hour or so until firm. Top it with a layer of halved frozen dark sweet cherries, cut-side down, then return it to the freezer. Make the mousse filling. You heard me – mousse. Filling. If you hear a choir of angels singing in the background, don’t be alarmed. It happens every time. I used maraschino cherry liquid for my filling, but if you want to go the official-official black forest cherry route, use kirsch, a.k.a. cherry brandy. Spread the filling evenly over the cherries in the tart pan, then smooth the top with an offset spatula. Return it to the freezer and try your best not to swipe a lick on its way back in. When the tart is solidly frozen, top it with whipped cream, chocolate shavings and maraschino cherries (or extra dark sweet cherries, either/or). Time to slice! Or faceplant. Whatever works for you and your sweetie.